Portable Projector Screen Indoor Outdoor Lightweight Folding Movies Screen Wrinkle Free 100 inch HD Projection Screen 3D Rear Front by NIERBO at FloType. MPN: PSP100U1. Hurry! Limited time offer. Offer valid only while supplies last. ●WRINKLE FREE: 2018 new design, made of synthetic fiber with 1.3 GAIN that the projection is sharper and brighter than most other projection screens, the projection screen are thickened and smooth, wrinkle-free anti-crease when folded and crushed. ●FREE INSTALL ACCESSORIES AND BAG: Come with free hooks and ropes that you can easily install without purchase other accessories. portable black bag avoids soiling the screen and you can take it anywhere you want. 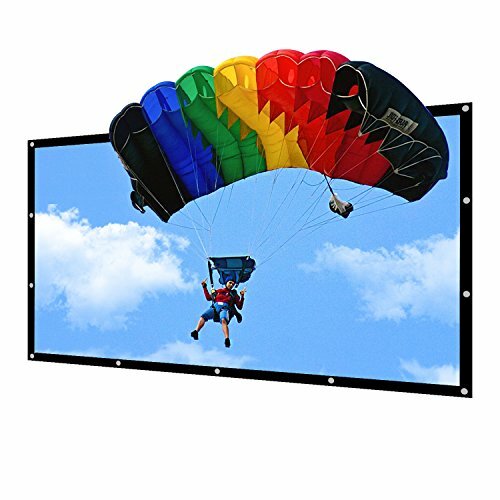 ●SIZE AND FRONT REAR PROJECTION: 16:9 screen format and diagonal 100'' offers 97x55'' viewing area (include 1.18'' black border) with 12 hanging holes, compact one-piece,1.48 Lb lightweight and folding design support rear front projection. ●APPLICATION: It is an ideal choice for home theater movies, classroom training, conference room presentations, outdoor camping. ●LIFETIME GUARANTEE: Lifetime warranty and friendly customer service, if any issue, avoid hassle return, replaced directly freely and delivered within 2 days or fully refunded within 30 business days. contact us service@nierbo.com thanks!